This site is part of the Flight Scan group, specialists in Flights, Hotels, Car Hire and all your Travel needs and we act as as agents for all World Airlines. If you are hoping to fly with Adelaide Airways, you are too late, so why not click on the picture and see what Qantas has to offer? Then follow the navbar icons to our parent site where you can search our selection of leading Travel Service Providers which will help make a good trip into a great one! 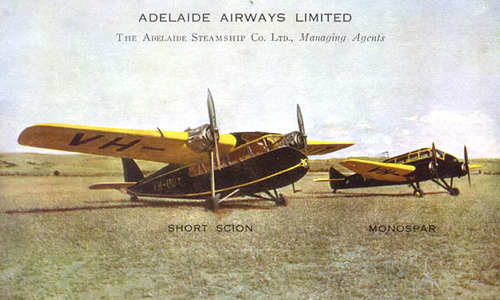 Adelaide Airways commenced operations in 1935 as a subsidiary of the Adelaide Steamship Co. It absorbed West Australian Airways in 1936 and later merged with Holyman's Airways to become Australian National Airways. After merging with Ansett in 1957 to form Ansett-ANA, the name finally disappeared in 1968, totally absorbed by the Ansett banner. Aviation never stands still and now Qantas is your first choice for travel to Australia. Click in the search box on the left to access the Qantas booking engine for the best selection of connections to Australia. Then take a look below at some of the other Airlines serving Australia, before making a final impartial check with Skyscanner.